At the same fork junction above, taking the left fork south, you will go past the magnificent pine and fir forest and the village of Lampou Myli. Continuing on this road you will arrive at Mytilene. However at the first junction after Lampou Myli, taking a sharp right turn you will go through the village of Keramia and outside the village of Ipios. A little further on a diversion to the left will take you to the picturesque village of Assomatos with the church of the Archangels and the leafy river valley of Agioi Anargyri and its homonymous chapel. This is an ideal spot for a picnic. Returning to the main road, you will go through the picturesque Karini, an idyllic location with fresh water springs running through it, rich vegetation and a huge hollow plane tree that the painter Theophilos had made his home for a time. After a few kms, travelling through silver green olive groves and past a few county chapels you will arrive at another fork junction. 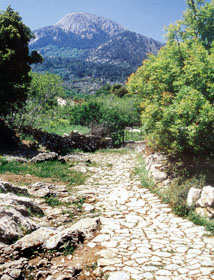 Taking the left fork you will arrive at the town of Agiasos. Its one of the most beautiful mountain villages of the island, build amphitheatrically on the slopes of Mt.Olympos. Just as you enter the town, almost opposite the first petrol station you will be able to visit a Private Folklore Collection. Just after the bus station you can visit the Cultural Centre "Anagnostirion", the beacon of tradition and cultural life and the leafy Garden of the Virgin Mary featuring a huge century old plane tree. In Agiasos the folk arts (pottery, ceramics, fretwork, weaving, woodcarvings, handmade furniture) are part of the everyday life and you will be able to buy good quality items to take home. The heart of the town literally and spiritually is the Church of Panayia the Vrefocratoussa (Virgin Mary holding the Holy Infant), which attracts Christian pilgrims worldwide. 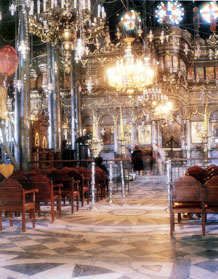 Within the churchyard you can visit the Byzantine Ecclesiastical Museum and the Folklore Exhibition. If you continue ascending through the town, you will be rewarded with the most wonderful views. Turning left over the bridge at Stavri, you will be able to circumnavigate the town, exit it going downhill and meet the previous fork junction again. Taking the sharp turning to the left it will lead you downhill to the green valley of Agios Dimitrios and then uphill to the mineral water springs of Tsingos, just at the start of the great pine forest. Continuing on this road, you will notice on your right the great plains of Mikri and Megali Limni, where plentiful vegetable and fruit crops are grown every summer. Just about there on the right, there is a signposting to Ambeliko. If you are feeling adventurous and have a head for heights take it. Your reward is not going to be the destination but the journey. You will follow the signs and slowly but surely ascend the slopes of Mt Olympos, arriving at its peak and the chapel of Profiti Elias (OK and the TV antenna). In a truly breathtaking experience, you will be rewarded with a magnificent view of the whole island, the Gulfs of Kalloni and Gera either side of you and Agiasos at your feet. The descent is equally breathtaking. Back on the tarmac road, turning left you will be heading towards Vassilika, and Skala Vassilikon a quiet traditional village, known by this royal name because royals of the Byzantine times were exiled here (Irene the Athenian and Konstantinos VIII the Monomahos). It is believed that St. Paul, the Apostle of Nations arrived to preach the Gospel to the Lesvians at the coastal location of St.Paul nearby, where the homonymous church is located. The waterfalls at Makri are also of great beauty and worth visiting. 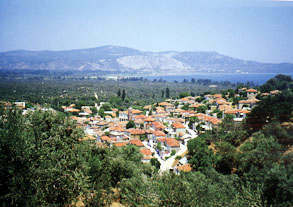 Not far from Vassilika, taking a turning to the right, you will arrive at the small village of Lisvori. 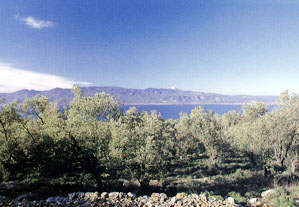 The locals are mainly farmers tending the olive groves and growing aniseed (the essential ingredient for the production of ouzo), onions, clover, animal fodder and wheat. Their homemade bread is renounced. 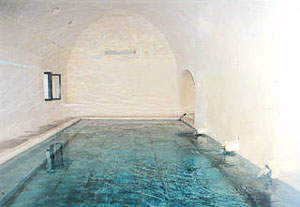 The Thermal Springs of Agios Ioannis located there are of great therapeutic value. They are ideally suited for dermatological conditions, with temperatures of up to 69 C, radioactivity levels of 2.6 units and separate pools for men and women. Ruins of a sunken harbour have been discovered on the costal location Kourtir. Also ruins of a Byzantine fort can be seen at the site of Skamioudi. Getting back on the main road heading for Polychnitos, on your left you can see the signs directing you to the Monastery Damandriou. It is a Byzantine Monastery (14th Century) set in calm surroundings, with wonderful wall paintings of Byzantine Art and significant ecclesiastical items. Backtracking to the main road again, you can continue your journey for the town of Polychnitos. Just before you enter the town proper, on your right there is a sign directing you to Skala Polychnitou, where its Salt Pans are producing the whitest salt of the Mediterranean. Its unique Wetland, rivalling the Wetland of Kalloni, is home to many migrant and indigent species of birds in the spring and autumn.The sight of the great flamingo in large groups in the water is one to behold. 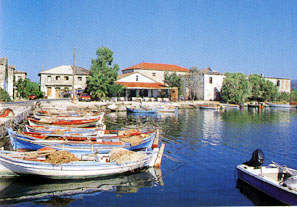 Skala Polychnitou is a budding holiday resort with rooms available to rent, a commercial port (boats come to load salt) and a fishermen's harbour. They fish the Gulf for sardines and other delectable fish and seafood, which can be enjoyed at the small tavernas on the quay. To the left of Skala Plolychnitou is the ancient site of Halakies where the ruins of an early Byzantine church were found. 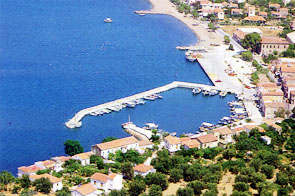 To the left of Halakies, you will come upon the coastal hamlet of Nyfida, another aspiring resort with rooms to rent and small tavernas at the quay. Back again on the main road, you will enter Polychnitos, a typical provincial town. The Church of Agios Georgios, its patron saint, and its belfry (build in 1892) are worth visiting. You can also visit the Folklore and Historical Art Collection, exhibiting relics of bygone traditional village life. The Collection of ancient coins (app. 130 pieces), discovered in the neighbouring regions can also be seen at the Polychnitos Secondary School. The oldest coin was minted at Mytilene, is dated back to the 4th century BC and depicts the head of Apollo and a harp. Just out of Polychnitos on the left, you will find the Thermal Springs of Polychnitos, bubbling up from the earth at temperatures of 80-92 degrees Celcius, radioactivity levels of 1.6-6 units, which are a match for the German Spa of Wiesbaden. They are recommended for the treatment of rheumatism, arthritis, gynaecological and dermatological problems. The facilities include two bathing pools, changing rooms and six rooms to rent, for those that wish to stay on site for a series of treatments. Returning to the main road again, you will be heading for the traditional village of Vrissa, with its plane square. 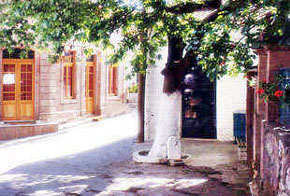 The Natural History Museum is located not far from the square, next to the Church of Agios Konstantinos and Agia Eleni. The exhibits - palaeolithic fossils (animals, plants, rocks) unique not only to Greece but perhaps to the whole of Europe, were excavated at the region of Vrissa and Vatera. The Museum is a Department of the University of Athens. During 2002 new premises with extensive facilities for Research and Education will be build just outside of Vrissa, on the road to Vatera. 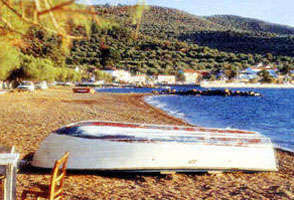 Exiting Vrissa you are heading for the best beach of Lesvos, at the coastal resort of Vatera. The 8 km long - 30/50 meters wide beach of shingle and sand dunes is rated as one of the best beaches in the Mediterranean and has been repeatedly awarded the Blue Flag of the E.U. Vatera is a rapidly developing holiday resort, with a wide choice of holiday accommodation for independent holidaymakers and traditional, good value tavernas. Apart from the unrivalled beach, it offers a traditional environment, culture, and many choices for the naturalists (footpaths for hiking/cycling, birdwatching etc). At the cape of Agios Focas with its natural harbour, the remains of the Temple of Dionysos, and the homonymous chapel you can enjoy the best sunsets of the Aegean. At the eastern end of the Vatera beach the road leaving the resort will take you to the picturesque village of Stavros, Upper & Lower, named thus due to the river Vourkos that divides the small village. Quite paradoxically Upper Stavros lies lower than Lower Stavros which is located at a higher level. The northern road between Stavros and Ambeliko snakes upwards and is an unsurfaced one. Therefore you must drive with great care as you may cause damage to the undercarriage of your car. The reward of your ascend will be the great mountainous views and the small chapels dotted along the way.From Ambeliko driving through the small villages of Akrasi, Neochori, and Palaeochori you can get to the coastal location of Melinda for a well deserved swim in the clear sea and a rest in one of the two homely tavernas. To the west of Melinda, you can visit the small hamlet of Drota its cosy beach and the picturesque chapel of Panayia Kryfti fashioned inside the high cave by the sea. 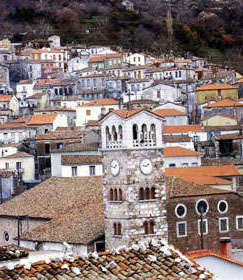 To the east of Melinda you will find the small town/port of Plomari. 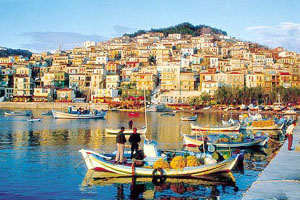 This town is famous worldwide for having the most important ouzo distilleries in Greece. It is also a cultural centre with the Cultural Society of "Benjamin of Lesvos" and several Museums: The Soap-factory Museum, the Industry and Navy Museum, the Folk Art Museum and Library, the Ecclesiastical Museum and the unique Museum of Ouzo. 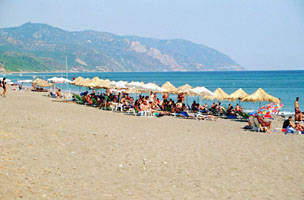 Leaving Plomari, you mustn't miss the beach of Agios Issidoros and the villages of Plagia and Trigonas. Also before you get to the villages of Gera its well worth it taking a diversion to the right and head to the sea again and the beach of Tarti for another cooling swim. Returning to the arterial road you will be going through the picturesque villages of Skopelos, Messagros, Pappados, Placados and Palaiokipos. As you approach the Gulf of Gera, turn right towards the hamlet of Napi and head south again to visit the coastal hamlets of Evriaki, Chalatses, Perama, Marmaro and Pyrgi. You will be rewarded with the views of rural houses, small churches and ruins from the Byzantine Era. To follow the shores of the Gulf of Gera to its top, you will have to re-trace your steps. The scenery is bewitching, combining the silvery-green colour of the olive trees and the sometimes-light blue, sometimes deep-green colour of the sea water. The waters are especially calm because the opening of the Gulf to the Aegean Sea is very narrow. Thus visitors get the impression that they visit a lake reflecting the rich vegetation of the surrounding area. This scenic journey will take you through the village of Kato Tritos to the village of Dipi with its impressive industrial buildings of the 18th and 19th centuries, (olive presses & ware houses) a sign of the past prosperity of the area. Just after the village, as you round the Gulf, you will come to the Thermal Springs Geras and its adjoining tennis courts.